You are here: Home / Pregnancy / Pregnancy Apps You Need Right Now! You spend a lot of time on your phone, right? 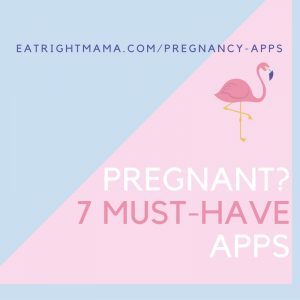 Well–you might as well find the best pregnancy apps to help you have a healthier, more informed, and fun (Yes fun!) pregnancy! Check Out These Eating Expectantly Approved Pregnancy “Apps”. All apps are free and available for iOS and Android unless otherwise noted. Ovia Pregnancy Tracker & Baby Calendar focuses on mom’s health. You’ll find personal feedback based on your age, BMI etc. and you can sync it with your fitness tracker to see your whole health picture. Importantly, there’s a food log and research proves there’s nothing like keeping track of what you eat to improve the quality of your diet. You can set up reminders to take your prenatal vitamins too. BabyBump is a pregnancy tracker and social health network for expecting families. Yu get a personalized countdown screen with weeks and days remaining and weekly info about your baby’s development. You can also read up on symptoms, cravings and other changes on a weekly basis. Of course, there’s a curated shopping experience too! It’s been selected as a Top Pregnancy & Fertility App by HealthTap. My Pregnancy & Baby Today by Babycenter From the website you know and love, this app gives you tracking, information and a way to connect with other moms. One clever addition–you can turn weekly bump pics into a time-lapse video! The advice continues postpartum as you track your baby’s development on a calendar, organize photos of baby “firsts” and get the “new parent” advice you need. You can also connect with moms of babies born the same month as you–the same moms you met when pregnant! The Bump App Daily Pregnancy & Baby Tracker. If you’re a shopper, this one’s for you! This app delivers with content from The Bump website, as well as pages and reviews for more than 15,000 products of the ‘most registered for’ products. The app also compares your baby’s size to that of a fruit! (I like that!) You have access to expert content plus feedback from other moms. Available for the Apple Watch. Note: This page contains Amazon Affiliate links, which means I’ve personally used the products or done enough research to recommend their use. « Which Individual Nutrient Supplements Might You Need during Pregnancy?